This morning as I was continuing to read A Long Obedience in the Same Direction: Discipleship in an Instant Society (yes, I am still reading it. I haven’t been reading too much in the last 3 weeks. ), by Eugene Peterson, I’ve sat and pondered Psalm 131. Only three verses, but more packed into these three verses than I can even begin to imagine. It is as Charles Spurgeon said, this Psalm “is on of the shortest Psalms to read, but one of the longest to learn.” Here is the Psalm from the paraphrase, The Message, that Eugene translated, and the ESV. I don’t want to be king of the mountain. I’ve cultivated a quiet heart. my soul is a baby content. 3 Wait, Israel, for God. Wait with hope. What are your initial responses as you read this Psalm? I’m wondering what happens in the lives of others they (you) read it! As of today, I have another (yes another) pocket Bible that you will be able to find in my “I-carry-my-bible-books-moleskine(s)-and-wallet-in-it-bag” (not a “murse”) that I’m stoked about. Not so much, because it will help me learn this language, that some days feels impossible to learn, but because of the great things that could happen with it in this country! About a year ago, I wrote a post, entitled Czechs’ spirituality, Life Change and the Bible…, about Sasa (Alexander) Flek, who was heading up a new translation. Well, it’s done! It should be, from what I hear, released in full by the end of the year and there are already several expressions of it out now. 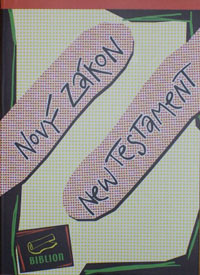 One of those expressions is the Novy Zakon/New Testament version that I am overjoyed to own! On one page the new NBK version (The New Bible of Kralice, or Nova Bible Kralicka) and on the other page the NLT (New Living Translation). So great! As I said, I’m stoked how this will help me, but even more stoked to stock pile these Bibles and give them out like mad to the young men I work with. Tonight I started reading the Gospel of Matthew and was very impressed with the translation. So impressed it’s hard to wait to simply get more that I can give out. Please pray that God would honor the work of Sasa and everyone that put so much time, money, love and much more into this translation. I always talk about wanting, praying for, yearning for, and laboring for a Revolution centered around the person of Jesus here in this city and country and God has given us, through the work of these dear people, a tool to help us move towards that. Please, please pray that God would use this to that extent and that lives, and this country as a whole, would be changed forever! Saturday morning I was doing some prep work on a support presentation and before I could get to it I checked out a few of my morning reads on the net and found an amazing piece over at the Prague Post, entitled The Gospel according to Czechs. Needless to say, that title caught my eye! 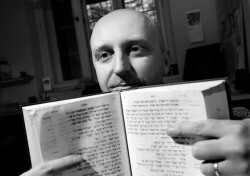 The article highlights Sasa (Alexandr) Flek, his story of life change about how his life was turned upside down by the revolutionary love of Jesus and how now he is working hard to come out with an up-to-date translation of the Bible in Czech. Flek’s heart for the Lord and the Czech people bleeds through in this article. I didn’t realize the lack of the translations that are, or aren’t, in Czech. It makes sense to me though because many of the guys that I encountered and had relationships with in Czech who had read the Bible before acted like it wasn’t relevant to them at all. It was an archaic thing to them that didn’t have any relevancy. Thus there was little to no chance they would ever get in it and let it speak into their life. Little did I know, it was because there isn’t a modern translation that is widely distributed. (WARNING – RANT. This happens to make me sick as an American who can go to a Christian bookstore here in America and choose from more translations than I know what to do with. Here is an idea, how about we stop adding to this and stop spending money on all the Bibles for every segment of our culture (i.e. Young Men’s Bible, Teen Girls study Bible, Adventure Study Bible, and more). I think you get the point; when I did a search there are over 670 study Bibles available here in America. Here is an idea, go to this translation page and make a donation to help a country have ONE relevant translation! Thanks for enduring this small rant.) Here are a couple more quotes about why there is an extreme need for this new translation! The translation is not a matter of proselytizing, he says. It’s a matter of national education. Because of a series of “historical catastrophes” the suppression of the Hussites, reactionary Catholicization under the Habsburgs, the decimation of the Czech language, communism the country has been cut off from its Judeo-Christian tradition, he says. Talafant believes the project “has the potential to change this country,” and he considers other Bible translations that are now also close to fruition partners in this effort. “Our competitors are atheism, Islam, and the indifference and immorality of our society,” he says. I was surprised to read that they included Islam as one of the competitors of Christianity. Because in my time in Prague Islam hadn’t made too many inroads into Czech yet, but it seems like that it is only a matter of time. The competitor that is most obvious is the Czech indifference. Sasa hits on this as the article wraps up. I would encourage you to go and read the whole article, click HERE.